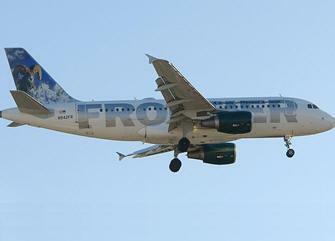 June 10, 2011 - The U.S. Department of Transportation (DOT) fined Frontier Airlines $40,000 for failing to display on-time performance for its flights on the carrier’s Web site as required by DOT rules and ordered the carrier to cease and desist from further violations in the future. According to DOT’s airline consumer rule that became effective in April 2010, the 16 largest U.S. carriers must post information on their Web sites about the on-time performance of each of their flights. The information must include the percentage of flights that arrived within 15 minutes of schedule; the percentage of arrivals that were more than 30 minutes late, with special highlighting if these flights were late more than 50 percent of the time; and the percentage of cancellations if more than 5 percent of the flight’s operations were canceled. DOT’s Aviation Enforcement Office reviewed Frontier’s Web site and information provided by the carrier, and found that its on-time performance data were not available to consumers visiting the site during a period of time in early 2011. Frontier did not discover or correct the problem until after the Enforcement Office notified the carrier. The Department’s on-time performance (OTP) data rule enables consumers to make informed choices when booking air transportation by requiring the posting of information on carrier websites to indicate which flights are often late or are often cancelled. Specifically, the rule requires reporting carriers to display the percentage of arrivals that were on time (i.e., within 15 minutes of scheduled arrival time), the percentage of arrivals that were more than 30 minutes late (including special highlighting if the flight was late more than 50 percent of the time), and the percentage of flight cancellations if 5 percent or more of the flight’s operations were cancelled in the month covered. This information must be provided in the initial listing of flights or by showing all of the required information via a prominent hyperlink in close proximity to each flight on the page with the initial listing of flights. By requiring carriers to display flight delay data to consumers in the browsing/shopping phase of booking air transportation, consumers are able to identify flights that suit their travel needs and abandon consideration of flights that frequently experience lengthy delays or cancellations if they choose. Reporting carriers that do not disclose performance data on their website are not in compliance with section 234.11. Violations of section 234.11 constitute unfair and deceptive practices in violation of 49 U.S.C. § 41712.